It’s an exciting thing to have a bow. Seeing a lady hunting for deer with her bow is such a pleasurable scene to behold. If you’re a deer hunter or you’re hunting for another game, you likely do it with a bow and arrow. As an archer, you know that the care of your bow deserves a paramount place in your hunting schedule. You must safely transport your bow in the most decent way between one hunting region and another. Also, your bow needs to be well protected from all sorts of damage when not in use so that it can retain its reliability. This will let you appreciate the need for a bow carrying case for preventative reasons. And bows are very sensitive and must be housed in not just any bow case, but with the professional ones. Nevertheless, the bow case you’ll acquire will depend on several factors. You firstly need to recognize what you need in a bow case. The makeup of your hunting gear comes to bear here. And interestingly, the market is filled with a lot of bow cases of different models and designs. That means you must first understand your type of bow before you can be sure of buying the right one. The bow case review in this post will assist you to be able to determine which of the bow cases you should buy. Regardless of whatever you may have read, this is one of the best bow cases for 2017. It’s a very small case, so it’s very light to move about. At the same time, it’s tough and highly protective of your gear. It has a lot of attractive features. 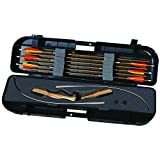 You will certainly not want to overlook a small case that can accommodate as much as 18 arrows (with the maximum length of 34 inches) and bows of 62 inches. Or what would be too much to pay for a bow case that can be securely locked such that your gears are safe in any weather condition? Despite the size, it has a very spacious storage and different compartments for your accessories. So, if you’re carrying the Vista Traveler Takedown case, your gloves, your armguard, and other items that you need while hunting will each have a different slot. This is perhaps the best bow case for takedown recurve bows with high-quality padding of foam and rugged shell. This compact bow case is quite mobile and very fit for the very mobile hunters. Surprisingly enough, it’s virtually indestructible. 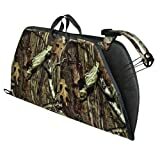 The Mossy Oak Bow Case comes across as the best compound bow case. There are so many interesting features of this bow case that makes it the best for hunters who travel a lot. For instance, the combination of a heavy-duty zipper, double pulls, and the shoulder straps makes it convenient to move around. It also comes with a lot of accessories. This makes it possible to store bows and other hunting gear in this case securely. Mossy Oak Compound Bow Case is by no means a small bow case. It’s a very large one to the extent that most crossbows can ideally be stored there without hassle. There’s an extra room for all other items like bolts and you’ll be able to organize all your gear neatly. It’s a quite versatile bow case in the sense that it fits most types of bows. Yet, it doesn’t have too complicated pockets. If you’re a simple archer, this might be just what you need. Thus, you won’t have to worry about the size of your bow. Durability is another attraction of this bow case. It could withstand any condition. You won’t have to worry about your pets or kids damaging your bow and even the case itself. It doesn’t matter if you prefer a bow hard case or a bow soft case. The hunters who know that their hunting session can be tough and rough need Allen Company Gear Fit Compound Bow Case. This bow case is versatile and efficient. It’s able to accommodate the bows of different kinds. Using this bow case offers a lot of options for organizing your gear. It has at least seven designed pockets for this purpose. So when talking about Allen Company Gear Fit Compound Bow Case, you don’t just talk about a bow hard case or a bow soft case. You’re talking about more than a bow case. The bow case is portable and very mobile, thanks to its shoulder strap and its handle grip that is padded. It’s light enough to be carried by virtually anyone. And if you’re the type that doesn’t have the time for all the time-consuming pleasantries while using a bow, you can count on this bow case. Its zipper pulls are easy to grab so that you can quickly lay hands on your archery in no time. On top of all this, it’s very durable because of its quality build. The heavy-duty polyester and weavings of its outer part complementing the suede lining of the interior will give it the everlasting rugged use. And the rubber handle is detachable. In most of the bow cases reviews you would come across, the Plano Protector Compact Bow Case will be referenced as the best bow case for the budget. So if you’re on a tight budget and must get a quality bow case, make the Plano Protector Compact Bow Case your best choice in the market as getting a case for your bow shouldn’t tear your pockets. It comes at very good prices in the market. Yet, it has the attractive features of the other bow cases that you pay a lot on. The shape in itself makes it attractive. Its construction involves high-density foam so that your bow will not just be housed but will also be protected from the damage so that each time you’re using it, it’ll in a top shape. The foam protects it from dust and humidity; elements that can drastically reduce the lifespan of a bow. It’s made airline travel-compliant, so that you can travel with it to any hunting region by air. It’s lightweight and this improves its mobility. In spite of the price, it has enough storage for your bows, arrows, and extra archery materials and accessories. SKB Hunter Series Bow Case is a big name in the class of the compound bow hard cases. But our emphasis is not just on the name. We’re particular about the quality. One of the reasons for including this in this review is that this bow case is both tough and light, unlike other hard cases that are usually heavy. It’s one of the versatile bow cases; you can hardly see any type of bow that it can’t accommodate. You would also love the invaluable plush lined EPS inserts. This bow case is portable and ready to accompany you to any hunting activity, thanks to the comfortable handle. The bow case is built to protect your bow from dust, moisture, and other dirt. Complementing its safety is its lockable metal latches. The structure of the bow case is supported by the enhancement with the stylish embossment. To enjoy the maximum use of your bows, you need to understand their sensitive nature. This makes it mandatory for you to give a serious consideration to the bow case that will house your bows. This review should guide your thinking before committing your hard-earned.